The challenge comes as part of a lawsuit filed earlier this year seeking to bar the city from forcing the removal of a multi-story supergraphic sign on the historic Hollywood Roosevelt Hotel. The sign was put up last year without a permit by a company called In Plain Sight Media, but the Nov. 5 filing claims the sign has “vested rights” because the company “incurred substantial liabilities and performed substantial work and complied with the City’s requirements for issuance of a building permit” prior to the City Council’s passage of the sign ban on Aug. 7. That ban exempted signs if permits had been issued prior to the effective date of the ordinance, and if substantial work on the sign structure had been performed. 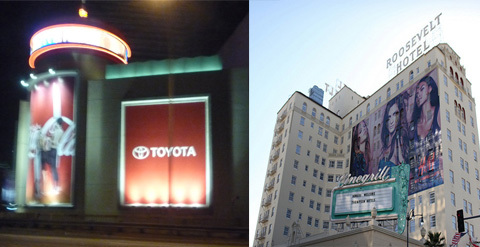 At the contentious Oct. 23 meeting, members of the City Attorney’s staff warned that allowing the signs on the freeway-facing façade of L.A. Live’s Regal Cinemas even though permits hadn’t been issued before passage of the ordinance could jeopardize the blanket ban on off-site and supergraphic signs. In heated exchanges, a number of council members claimed that they never intended to block off-site signage at that project and others that had previously received entitlements from the City Planning Commission, the Community Redevelopment Agency, and other government agencies. Chief Deputy City Attorney William Carter urged the City Council not to issue the permits until a ruling could be obtained from the federal court judge who is handling most of the 20-plus lawsuits involving the city’s sign regulations. Carter said he had invited lawyers representing AEG, the owner of L.A. Live, to join city attorneys in a meeting with the judge to discuss the issue, but that they had declined. At the City Council meeting, AEG president Tim Leiweke complained of threats made by City Attorney Carmen Trutanich, and said he would not “negotiate with a bully.” See video clips below of the Carter and Leiweke speaking at the meeting. Also, a clip of the attorney for the company suing the city in the Roosevelt Hotel case telling the City Council at the Aug. 7 meeting why she believes the sign ban is unconstitutional.